In my job I am constantly pulling industry research, stats, and trending information for various presentations. Hopping from one source to another is obviously a pain. At one point you begin to say, "Does this even exist? ", "Am I making sense?" or "How else can I word this?" Until eventually you are left exhausted, frusterated and ultimately, information overloaded. 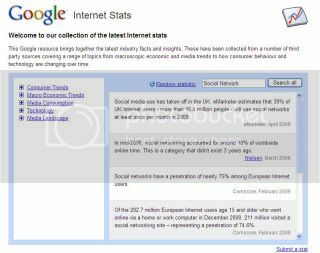 This, however, my friends - is a thing of the past...or at least in the UK thanks to Google Internet Stats. I'm waiting for that one glorious day when I too shall have the brains at Google smile upon me and create a version for the US (which I'm sure is already in the works), but until then - here is a snippet of what this great new tool is all about! 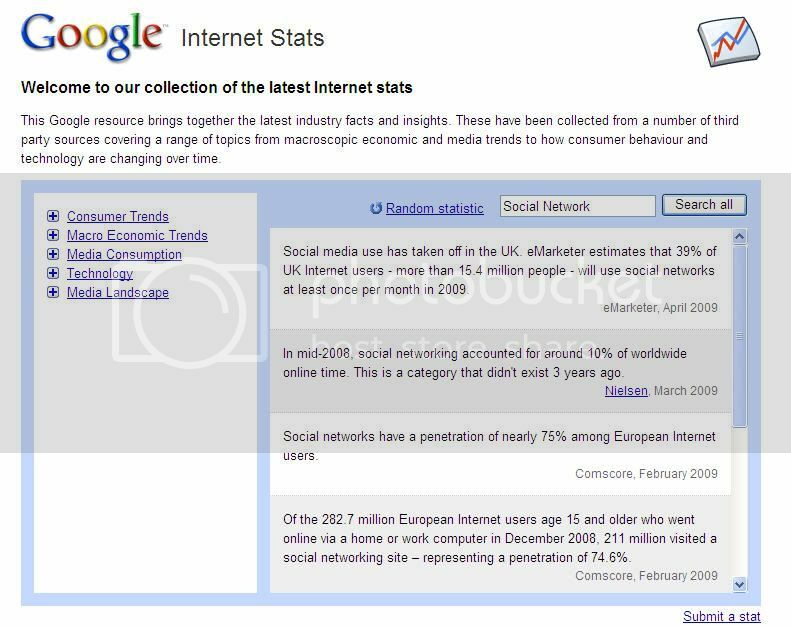 Google Internet Stats compiles all the lastest industry information from the most trusted sources like eMarketer, Nielsen, comScore, Hitwise and more. As if that wasn't enough, Google even allows outsiders to submit their own stats to add to the communal wealth. From these varying knowledge banks Google then breaks down the information and makes it available to you through three different routes. Curious about what is the latest and greatest in the industry? Not sure what to look for? 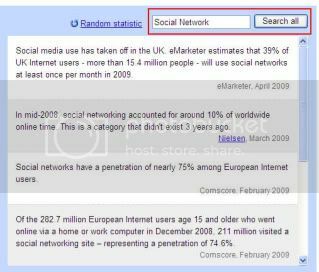 Click "Random Statistic" and Google will help you out. 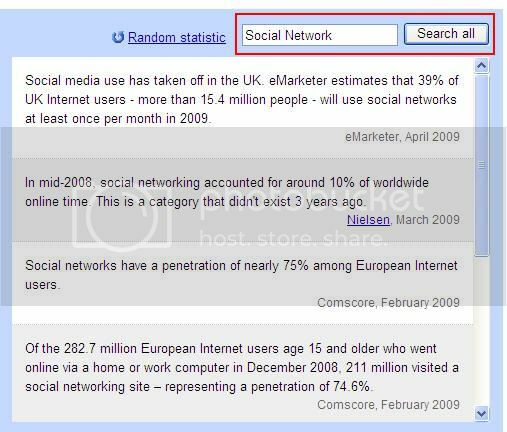 Google Internet Stats also has organized categories and subcategories along the left side to make browsing different topics a breeze. Like all things Google, there is a search option. Simply type in what you are looking for (but a little tip: keep it broad), and voila: information at your finger tips. Like I said, Google Internet Stats is currently only released for the UK, but if this says anything about what is yet to come - this marketing manager is pumped!